As a small office business owner in the U.S., it would be a smart idea to expect the unexpected where violent crime is concerned. Many small offices would be considered a slight to medium risk for violent acts that is unlikely to happen. However, that should not stop any small business from taking proactive measures to reduce threats. Perhaps it is much better to have an office panic button that you never use than to not have a panic button when you desperately need one. CRS Notify can help minimize that threat with our computer-based office panic button program. Often small businesses operate on a tight budget. The cost of adding a safety plan or installing panic buttons drops in importance due to funding issues. However, you will find times where an office panic button system would have been useful to help relieve a potential crisis situation. Moreover, all industries have some level of threat present. Installing a notification system should be seriously considered in light of recent news events centered around domestic terrorism. Why Not Pick Up the Phone and Call 911 in an Emergency? I always recommend calling 911 as quickly as possible. There is always a chance that the crisis might intensify when the criminal sees someone calling the police. Most often, staff members are slow to call for help in a crisis. Employees and managers may feel it is not warranted or want to avoid bad publicity. I hope that the delay in alerting authorities will change because threats are always present. Picking up the phone and calling 911 may not always be an option for a small office. However, tripping an office panic button could save your life during a life-threatening event. Keeping the panic low-key can help get responders notified as soon as possible. This is very critical during a crisis considering every second matters when an emergency threat is occurring. What is the Best Office Panic Button System? There are a lot of great office panic button system options on the market. When making a purchase for an office panic button, choose a system that will not cut into a large chunk of your time and budget. Look at a program that fits your specific safety needs. Also, make sure the system fills any communication gaps that your company may be facing. The two key points when deciding on an office panic button system is fast notification to responders and up-to-date communication. Timely information to those who need to know as well as first responders can make all the difference when lives are at stake. Furthermore, centralized communication throughout the event enables responders to handle the crisis more efficiently. How Much Should I Expect to Pay for an Office Panic Button? There are far more high-tech options over the old panic button systems available. You can usually find software notification systems at an affordable price. Many phone companies offer a hard-wired panic button that runs through the phone system. The general cost is close to $10 a month per button. Moreover, there are also alarm companies that offer a similar product that can be tied into your alarm service. Computer-based panic button programs vary from free to $25 a month per license. Through CRS, we offer several different feature-rich packages to fit any size companies needs. In addition, our popular one-user license for $25 a month is great for a small office atmosphere. 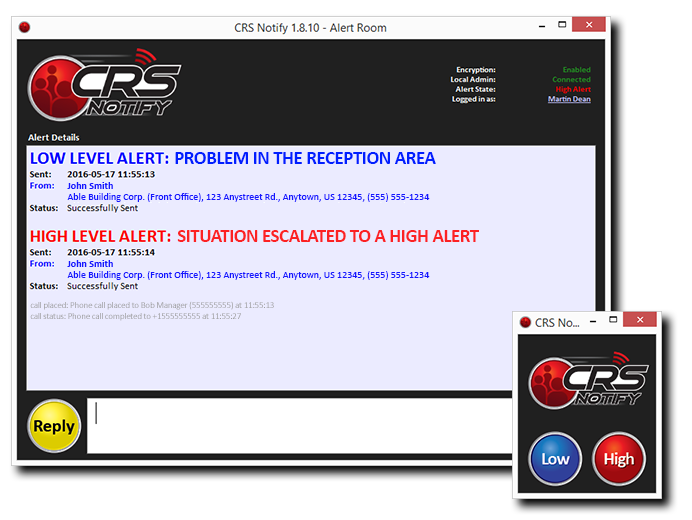 Our CRS Notify program also offers mass notification and E911 integration. The optional hardware devices through CRS plugs into a spare USB port. With the option to add a pre-configured message, you can alert responders with the push of a button. The optional hardware devices come to your door ready to use with the CRS Notify program. How Does an Office Panic Button Notify First Responders? 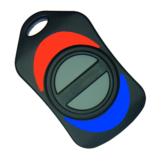 Mass notification capabilities vary from company to company offering the panic button program. Traditional panic buttons are directed to the local 911 center for that business. Unfortunately, the phone calls through the old school panic buttons can take a couple of minutes. Furthermore, traditional panic button systems do not offer verification that the alert has been received by responders. Many phone apps and computer-based panic buttons have to get local first responders or 911 centers on board to start any notification. We built the CRS Notify system to make an E911 call to local first responders and ten automated voice calls to any responders you wish. Responders will receive notifications with the locations name, address, and alert topic when the button is initiated. The CRS Notify program also sends out notifications via an active alert messaging window, emails, and text messages. Still Unsure About an Office Panic Button?